As the world urbanizes with more than half of the world’s population living in the city, a mindful living its critical. 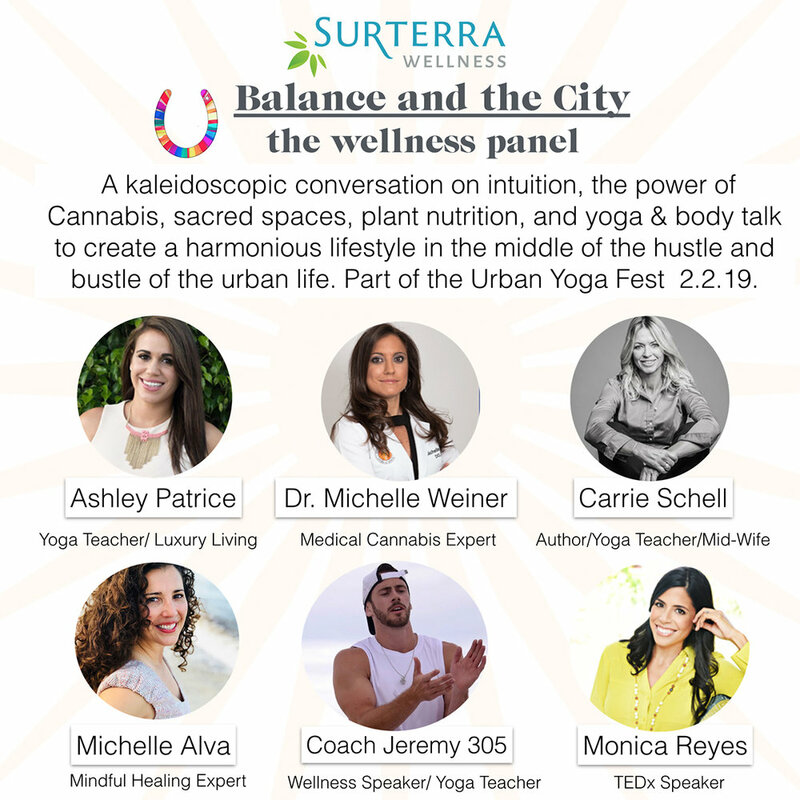 Welcome to Urban Yoga Fest and the Bohemian Collective. A lifestyle for the ones who are passionate about the environment, urban wellness, and the future of the community we live in. We design experiences to awaken your curiosity towards a mindful lifestyle in the city. Ashley Patrice is a well-respected professional who blends a background in business management with an exceptional ability to understand the needs of her clientele and build rapport with them while ensuring the very best performance. Working as executive for reputable, high end corporations, being the beneficiary of the knowledge and experience from CEOs and company presidents has overflown and transformed every aspect of how yoga is taught, instructed, and channeled to how listings are marketed, showed and sold. She has started her own non-profit "The Hanai House" which will umbrella all of the local fosters providing them with the resources they need. Dr. Michelle Weiner is a unique player in the wellness industry, taking an innovative approach to providing health and wellness services. She is known as South Florida's Medical Cannabis and CBD expert and educator. Dr. Weiner is faculty at Florida International University (FIU) and Nova southeastern University. Dr. Weiner completed her residency and fellowship training at the University of Miami. She practices personalized and preventative medicine focusing on the etiology and offering individualized holistic treatment options. She is double board certified in Interventional Pain Management and Physical Medicine and Rehabilitation. She is an advocate for and a leader in the Florida Medicinal Cannabis industry educating and helping people find relief. She treats spine and musculoskeletal pain, chronic migraines, performs ultrasound guided joint injections, uses platelet rich plasma (PRP) and growth factors and is well trained in aesthetic medicine including botox. Carrie has been immersed in health and wellness since the beginning of her career as a licensed midwife twenty-five years ago. Her career has evolved over the years with her doctorate studies, work as a health consultant, physical activity practitioner and yogi. Carrie developed a unique and highly successful recovery program rooted in yoga, physical activity and meditation. She is excited to be share her new book, Yoga Recovery…a mind, body, spirit journey to wellness. An innovator in her field, she has developed physical literacy programs for schools to help improve the physical and mental wellness of children and youth. She is presently launching Moral Compass Therapy, for veterans suffering from PTSD. Carrie believes in a mind, body, spirit approach to wellness and recovery as evidenced in both her personal and professional life, seeking to reconnect others to the Divine source of love in the Universe. Monica Reyes is an activist for compassion, a professional speaker, and a truth seeker born in NYC and living in Miami. She is anattorney, and owned a progressive all-woman law firm, when she suddenly experienced a call to her Soul. She realized that she is here to help people navigate the human experience, by bringing in ascended principles and strategies. Monica believes that life is not about escaping into awareness or enlightenment or all that feels good. It's about embracing the ENTIRE experience and being here, right now, in this moment. She believes that we are here to accept that we are both part Human and part Spirit. Part flesh, part magic. And when we can accept the mystery and learn to navigate this space, as we are, from the space of the Higher Self, that is where everything becomes possible. Michelle Alva has been a licensed women’s physical therapist for over 22 years with Specialized Training in Women's Health, Pelvic Floor, Pain Management Science, Pre/Postnatal Physical Therapy, and Sexual-Trauma Healing. She created The Alva Method Of Self-Empowered Healing, a safe-haven for self-healing journey to empower, energize and heal from the inside out. She is passionate about educating and empowering women to learn how to heal themselves, using the latest in science, practical and experiential methods. On your journey to self-repair, she will guide you to connect with your body and feminine essence, while embracing spirituality, balance and sexuality. You will feel empowered to let go of crippling past emotions, deepen your heart and soul connection, and live a richer, more fulfilling and healthy life. The Alva Method integrates neuroscience, movement science of physical therapy, the latest in how to align our sub-conscious beliefs and mindset to make lasting changes, along with mind-body-spirit medicine, and ancient wisdom approaches. Mireya is a conscious business strategist, yoga teacher and Add Heart Facilitator. She helps entrepreneurs, business owners and organizations master the art of Conscious Leadership or Leading with Heart. Karola believes a mindful design can be both functional and inspirational, an extension of who we are in this life. She is a mom, a designer, and a filmmaker who lives by the beach. Hawk utilizes her expertise within the film industry to transcend complex projects from development to completion, while telling magical and artistic stories.